Meet and greet your next best friend at the Rescue Roundup! We will have some adoption bags for animals adopted at the Rescue Roundup. Please visit the Border Collie Rescue booth for your bag of goodies! Get a FREE WELLNESS EXAM if you adopt a pet at this year's Rescue Roundup! If you adopt a pet at this year's Rescue Roundup, Canyon Pet Hospital will give you a certificate for a FREE WELLNESS EXAM! Get Two Nights Free Stay at Cinder Hills! Cinder Hills Boarding Kennels will have vouchers in the adoption bags for two free nights of boarding. The goal of the staff at Alpine Animal Clinic is to personally, and as a team, provide the very best care to the animals we see and their owners. Our purpose is to protect, cure when able, and alleviate suffering. When knowledge and medicine fail, our task is to be there with understanding and compassion. We will strive, always, to promote healthy and responsible relationships between animals and mankind. Want to adopt at the Rescue Roundup? Many rescues require applications and home checks from potential adopters. Visit the website of the rescue you are interested in, contact them and set up an appointment to get pre-approved! All the rescues listed below have clickable links - how easy is that! 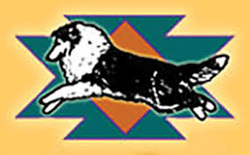 Arizona Border Collie Rescue promotes humane treatment through rescue, rehabilitation, education and the re-homing of neglected, abandoned and unwanted Border Collies. 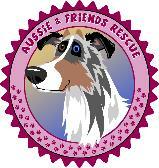 We have saved over 2700 Border Collies through our foster home program. We are 100% volunteer and 110% dedicated to this wonderful breed. Please visit our website at www.azbcr.org. Hands On Horses is a small 501(c)3 organization that is helping horses that have been retired or rehomed in the Flagstaff and surrounding areas. All donations are welcome to help this rescue retain the dignity of these beautiful animals. Please visit Deb at her booth during the Rescue Roundup. We are the largest GREAT DANE RESCUE group in the state of AZ and have been caring for our beloved danes, here in the valley, for the past 16 years. We are dedicated to working throughout the state to provide the proper care & placement of danes in need whether they are a pound puppy or an owner turn-in. Adopting your dane through the rescuers with the Alliance assures you a dane that has been temperament tested, altered and vet checked. We require a home check and a meet & greet with all family members whether they are 2 or 4 legged! We are a proud member of PACC 911, Western States Great Dane Rescue Association and Rescue Watchdogs - http://rescuewatchdogs.org. The ONLY rescue groups in the SW region we support and are affiliated with are listed and approved members of the Western States Great Dane Rescue Association. Please visit that site for details. We are a 501(c)3 not for profit organization. Our mission is to rehabilitate and re-home displaced Welsh Corgis, both Pembroke and Cardigan. We believe corgis deserve a second chance. We get our Corgis into rescue in various ways. We adopt them from shelters, network with other rescues to have them come to us and we have owners, who for various reasons are unable to take care of their corgi for any longer, turn them over to us. Our corgis are all examined by a veterinarian, have blood work performed to check for any problems, dentals performed, if needed, and are spayed or neutered prior to adoption, if needed. Desert Harbor Doberman Rescue of Arizona (DHDR) is Arizona’s first and oldest 501(c)(3) nonprofit Doberman rescue organization. We are headquartered in central Phoenix and utilize foster homes, veterinary partners, and volunteers throughout the state. We are incorporated in Arizona. As an IRS-certified nonprofit charity, we do not make or take a profit. We depend entirely on adoption fees and donations from people like you. Every dollar we receive is dedicated to rescue operations and to the care of the dogs. About 90% of all donations goes directly for veterinary care. The remainder goes for essentials that are not donated, and these we purchase second hand or at a discount whenever possible. Our staff and Board members are volunteers whose time, training, talents, and resources make it possible for us to exist. It's the mission of the Coconino Humane Association to operate a humane and caring shelter that will give aid to unwanted, abandoned and mistreated animals in Northern Arizona. Learn more at www.coconinohumane.org. 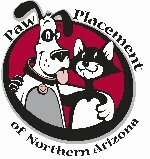 Paw Placement of Northern Arizona is a 501(c)(3), animal welfare organization committed to ending the euthanasia of unwanted or homeless companion animals and to ensuring that all companion animals living in our region receive the care and support they need to live a high quality life. When you are looking for a veterinary care clinic you should be able to count on superior care and excellent service. We at Pet Allies, Inc. in Show Low AZ have assembled an expert team of veterinary professionals to bring you the best possible healthcare for your pet. We have a state of the art veterinary facility which is clean, comfortable, and efficient. Call (928) 532-1602 to schedule an appointment and we will find a time that is convenient for you. Pei People Shar Pei Rescue, Inc. is a registered 501c3 non profit . We rescue and adopt in California, Southern Nevada, Arizona, New Mexico, Colorado, Oregon & Washington. We started in 2007 and focus strictly on rescue, rehoming and education around Chinese Shar Pei. ● To provide shelter and compassionate care for animals who are lost, abandoned or homeless; and to ensure that animals who come into our care are nurtured in a loving space while healing from fear, physical or emotional trauma, mistreatment or loss of caregiver. ● We respect animals as intelligent beings who possess emotions including unconditional love, happiness, fear, pain, sadness and joy, and who enhance the lives of humans. ● We are committed to rescue and rehabilitation of companion animals. ● We are dedicated to the elimination of pain, fear and suffering in all animals. Mountain Girl Rescue is dedicated to ending suffering and the causes of suffering by facilitating a pathway to a new life for dogs at risk throughout Arizona primarily by providing transportation to a network of no-kill shelters and rescues dedicated to adopting them into permanent, forever homes. Arizona Cattle Dog Rescue is a non-profit organization whose mission is to rescue, rehabilitate and ultimately re-home abandoned, stray and neglected Australian Cattle Dog’s. Whenever possible we also assist ACD’s who, because of extenuating circumstances, are unable to remain in their homes with their owners. forever families while raising awareness to eradicate Merle-to-Merle breeding through educational programs. Little Angels Service Dogs is 501c3 nonprofit organization of trainers and volunteers who work to provide highly trained dogs to assist disabled children and adults throughout the United States. The Verde Valley Humane Society exists to humanely provide for and protect unwanted, lost and abused animals; and to promote animal welfare through its policies and presence in the community." We are a a non-profit pet adoption center. We encourage safe and healthy pet management, spay and neutering, micro-chipping, and proper licensing for a safer community. We accept animals from the community for re-homing. We also house animals picked up as strays by Animal Control Officers. These are kept from 3 to 5 days before being made available for adoption by the public. 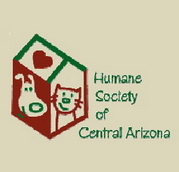 The Arizona Animal Welfare League & SPCA (AAWL & SPCA) is the largest and oldest no-kill shelter in Arizona. A "no-kill" shelter is an animal shelter that does not kill healthy or treatable animals even when the shelter is full, reserving euthanasia for terminally ill animals or those considered dangerous to public safety. AAWL is a registered 501c3 non-profit organization, tax ID 23-7149453. All donations are tax deductible to the extent allowable by law. AAWL rescues, rehabilitates and re-homes more than 4,000 dogs and cats that are abandoned or that have been surrendered by their owners. We do this primarily by rescuing them from other shelters in Maricopa County where they are likely to be euthanized due to the lack of time and resources to care for them. At any one time our shelter will hold 140 cats and 190 dogs. We also have a foster parent network of approximately 90 families who provide care and shelter in their homes for puppies and kittens that are too young to be adopted, and those animals that are recovering from medical procedures or that need socialization before adoption. All pets offered for adoption have been spayed or neutered; micro-chipped and are current on all vaccinations. Any medical treatments needed, including surgeries, are provided by our medical team and all animals are evaluated by our behavior department. Learn more about our Phoenix veterinary services and animal clinic. AAWL not only adopts companion animals into loving homes, we also hold a leadership position in the community in education and animal welfare issues. Please review our Education section to learn about all of our programs (including our school holiday and summer camps) and don't miss our extensive dog and obedience training classes.